The growing Catholic/nationalist population: is it the death-knell of unionism? Few people today would dispute that, when the state of Northern Ireland was set up in 1921, the intention was that it would have a permanent Protestant/unionist majority. But the state didn’t rely simply on a contorted line on the map. Gerrymandering and discrimination were put in place, to keep nationalists politically neutered. Derry was the capital of exclusion , with one-third of the population electing two-thirds of the Londonderry Corporation. And of course there was that famous case where Martin McGuinness applied for a job and was shown the door when he mentioned what school he had attended. Things are different now. Nationalists aren’t pressured into emigrating as they once were. Discrimination in employment is outlawed. There is one person one vote. Work-forces must be seen to be balanced in their religious make-up. The Orange state has indeed been dismantled. Not just that, but a biological time-bomb is ticking, and it’s ticking in favour of Catholics/nationalists. In 2014, Martina Purdy wrote an article on the BBC News website headed “Catholics now outnumber Protestants in Belfast”. 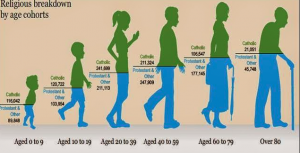 Between 2001 and 2011, the Catholic population of North-eastern Ireland rose by 1%; in the same period, the Protestant population of the state fell by 5%/. 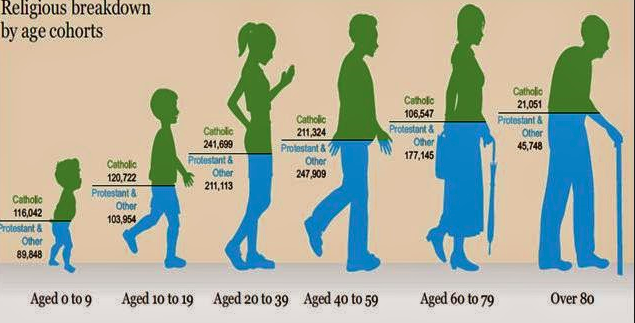 At present, if we look at those aged 35 and younger, there is already a Catholic majority. While the unionist populations is older and shrinking, the nationalist population is younger and growing. Add to that the fact that the DUP, as Joe Brolly recently pointed out, have managed to alienate the rising Catholic middle class, and the fact that by 2022 Catholic/nationalist voters will out-number Protestant/unionist voters, and the continued existence of this north-eastern part of Ireland is in doubt. You might go further and say, even now, its days are numbered. However, consider Hillary Clinton. She won almost three million more votes than Donald Trump – but she lost the US presidential election. So it’s possible to have more votes but still fail to win power. Which brings us to the redrawing of the Westminster and Assembly election boundaries that is currently underway. And if you think that sounds ominous, it is. Nationalists and republicans have reason to be afraid. Very afraid.